For journalist Dylan Alexander, it began with the discovery of a hidden tomb, thrusting her into the center of a gathering storm of violence and secrets. But nothing is as dangerous as the scarred, lethally seductive man who rises from the shadows to draw her into his world of dark desire and endless night. What I say: Somehow in my Blast from the past Midnight Breed-Readathon I managed to miss out reviewing book #4 in the series Midnight Rising so here it is... After discovering the empty containment cave (for the Ancient) at the end of the last book, the Order warriors leave Rio to seal the cave. Months later, a still destroyed and somewhat feral Rio is living in the cave when Journalist Dylan (yep great name for a girl) discovers both Rio, the cave and the strange markings. 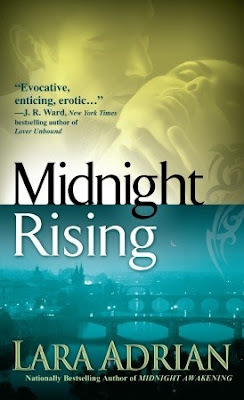 I enjoyed Midnight Rising because we got a lot of Rio's backstory. Up until this point Rio had been something of a victim; he was betrayed by his former Breedmate Eva and ended up scarred and tormented. Rio's Breed gift is as dark as they come and we get to see his struggle with his gift and potential bloodlust. Dylan is, SHOCK HORROR a Breedmate! She helps put Rio back together and uncovers some crucial info on Dragos and missing Breedmates. At times the story screamed Beauty and the Beast or perhaps Phantom of the Opera. Rio is plagued by both physical and mental scars and cannot understand how anybody like Dylan would want somebody damaged like him - The story was really sad in places and I wanted to comfort Rio, to help him through his self doubt. Dylan really suffers and has faced a lot of loss in her life; Adrian doesn't make it easy for Dylan, but I really enjoyed their story! A total nutjob. He had to be. What about the other people in this high-rent estate? Just more vampire fantasists like him, who believed they descended from a solar-allergic alien race? "What's going on?" he asked, meeting the cold blue eyes. "I just got f**ked," Nico replied, and evidently not in a good way. "Your scars are the most ordinary thing about you, if you want to know the truth."